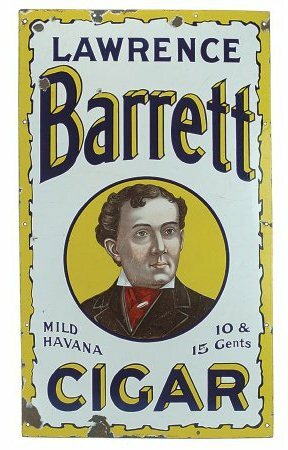 Description: “Lawrence Barrett Cigar, Mild Havana, 10 & 15 cents”. Sign features portrait of Lawrence Barrett, white background with torn edges to look like paper. Note: The blue version of this sign is worth somewhat less than the white seen here.